MI6 Competition: MI6 has teamed up with publisher Casemate UK to give lucky readers the chance to win copies of "The Cold War Spy Pocket Manual". 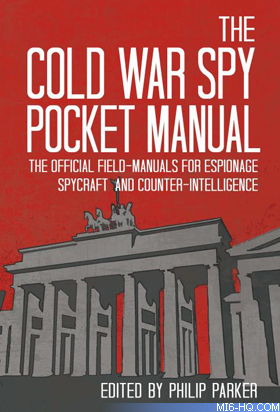 With material from the CIA, MI5 and MI6, the KGB, the STASI, and beyond, The Cold War Spy Pocket Manual brings together directives that informed nuclear espionage, assassinations, interrogations, and the 'turning' of agents. It reveals their impact on the Suez Crisis, the "Cambridge Five" the Cuban Missile Crisis and more. In its pages you will find a dossier of British techniques for interrogating spies (including "The Technique of Blow Hot-Blow Cold" and "The Legend of Cell Fourteen"), a guide to secret recognition written by a stage magician for the CIA (including flower in the lapel, wearing a Band Aid and tying shoelaces in a particular pattern), outlandishly detailed protocols for handling a dead drop, a document detailing some of the elaborate protocols put in place to detect potential traitors, and a CIA plot to lace Fidel Castro's cigars with hallucinogens, explosives or even a depilatory substance to make his beard fall out (and so undermine his revolutionary macho image). What was the code name Goldfinger gave to his bullion heist in Fleming's "Goldfinger"? Terms & Conditions: The competition closes at midnight GMT on 11th February 2016. MI6 will choose the winners at random from the correct answers received. The winners will be contacted via the email address supplied and their postal address will be requested. If a winner fails to respond within 7 days of prize notification, another winner will be chosen until all prizes are allotted. Competition is open to MI6 readers worldwide. Entrants must be at least 13 years of age.